Once upon a time, not too long ago, there was this girl who learned about a secret marked place called Ebay. She had been daydreaming for years about finding the perfect summer dress, and had nightmares about never finding it at all. She had heard stories about treasure islands when she was younger; about gold, silver, silk and beautiful treasures in all sizes and colors, but never thought she would take part in such an adventure herself. One day, this girl was sitting in front of her computer, feeling somewhat restless, when something inside of her made her shiver. It was not a bad shiver, more of a curious one, like those tingling goodbumps you get when someone touches your neck. She had typed in that tiny word, which wasn't really a real word, into her search engine - and was waiting for the bay to reveal herself. Confusing as it was to start with, she managed to click herself into an alley of sorts, which included all kinds of womanly items. Internet alleys aren't scary at all, just filled with pretty things. And not so pretty things. A lot of weird things too. -because searching a thousand corners in a thousand homes across the whole wide world can be rather difficult even when you are looking for the perfect dress, she found something. It was black. It had flowers. It was puffy at the bottom. It was perfect. All she wanted to do, was to press "buy it now" - but the auction did not end until two days later, and she did not want to go to war. A bidding war. She waited patiently for hours, almost forty-eight ones, and was sitting there, counting down. She imagined wearing it and feeling the fabric against her skin. Suddenly, someone else placed a bid. It was on! The price rose, but the beauty of the dress seemed to raise equally with every minute passing. She had to get it. It was her destiny. And when the last seconds were dissapearing into the nothingness of the internet, she placed her final bid. One week later, unaware of what was waiting for her in her mail box, she stayed in bed all day. When her lover came home from work, she heard that recognizable sound of a package wrapped in paper. And there it was. The beauty itself. Her whole heart pounded when she pulled the straps over her shoulders, straightened it out and looked in the mirror. It was love. True love. 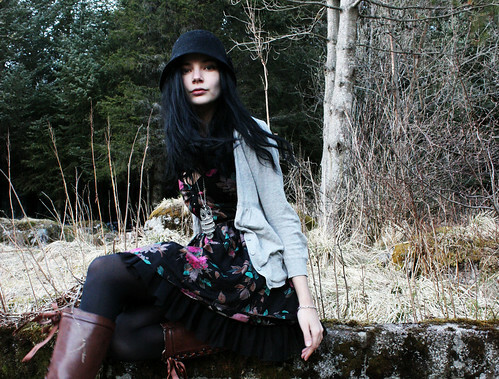 I'm wearing my new dress from Ebay, thrifted belt, owl-necklace also from Ebay, gray cardigan from H&M, hat from Nelly.com, random tights and boots from Benelli. Awww beautiful story for a perfect dress!! Great finding! It's really your face! Delicate and yet strong! Dette innlegget er nå på forsiden av Femelle.no. very pretty! great location too for the photos! Wow! 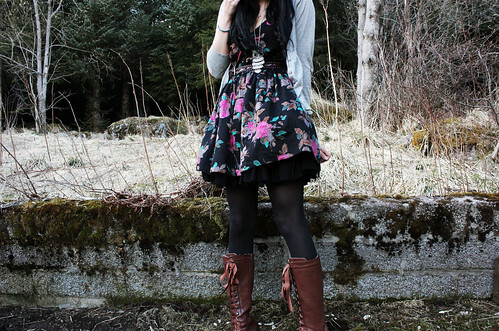 yey for you and your perfect summer dress. I have my perfect one too, but I'm saving it for the next summer, since I bought it in the last week of summer, I didn't have the chanse to wore it. 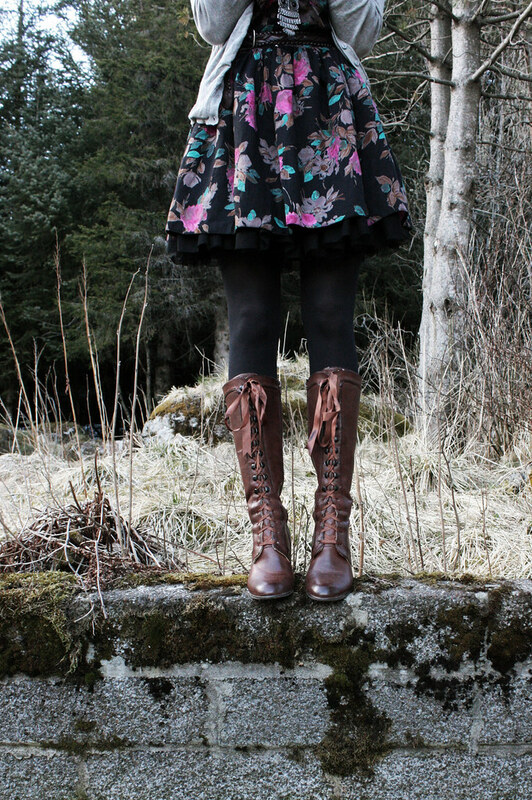 I love how it looks, the puffy bottom is lovely, and with the boot and the hat looks so cool. I specially love the second and the fourth picture, your hair looks so good framing your face. Kisses dear! enjoy that dress! PERFECTION! love love the fact that you turned your ebay ordeal into a fairy tale! that dress is a dream and fits you perfectly! you were meant to have it! you look gorgeous... pretty dress, pretty owl and very pretty grrl! what a great post. looking beautiful! love this! 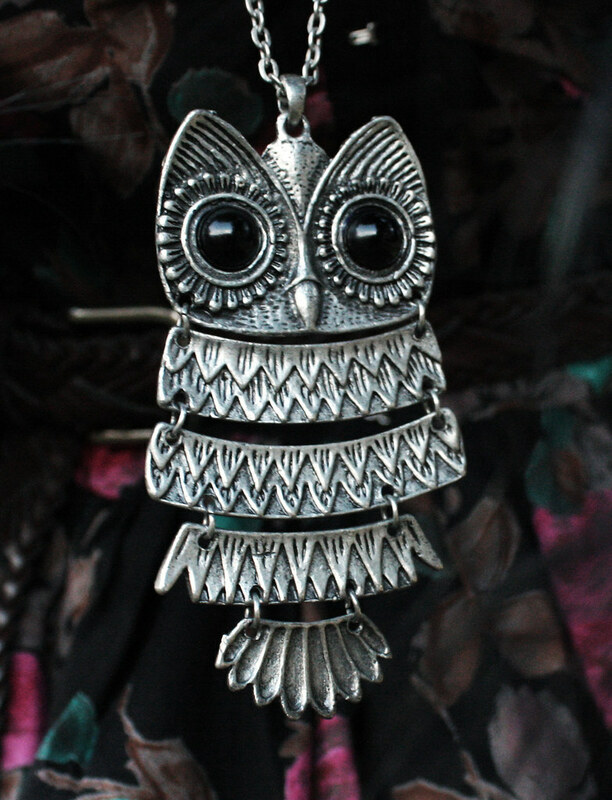 And the owl is so cute in silver :D! 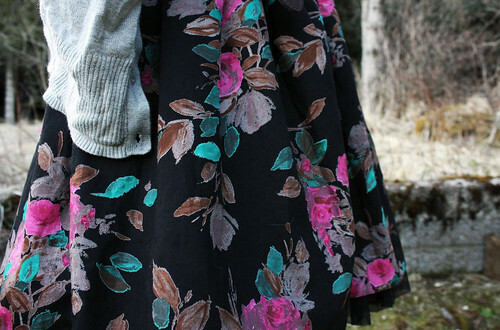 I love the fullness of the skirt. Very lovely! you always amaze me with your photos ! Wow, du er så utrolig vakker! Den kjolen var jo bare elsk! "It was black. It had flowers. It was puffy at the bottom. It was perfect." 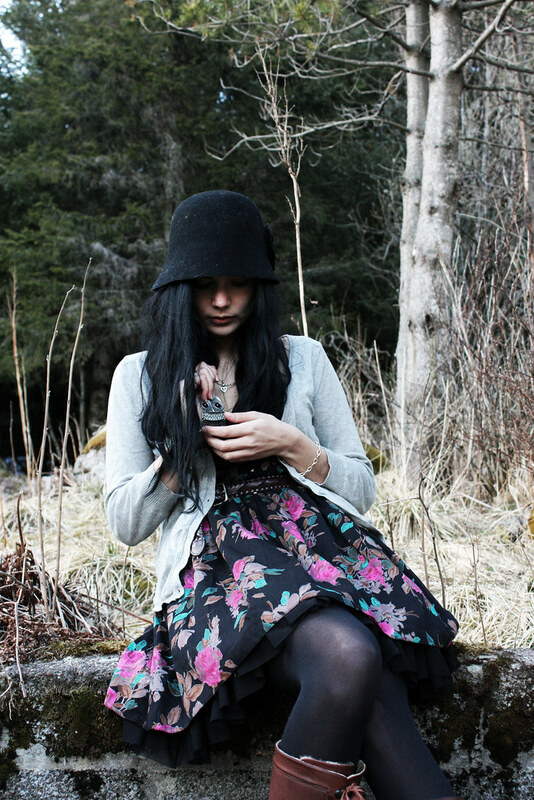 I really love the dress...and the owl necklace...love the photos dear!!! !